In the years 1949-1955 he studied Slavic, Romance and Albanian studies in Belgrade. He started working on a dissertation on the Old Albanian author Buzuku. 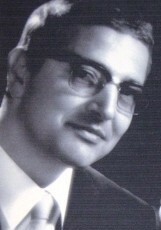 In 1956 with the help of his former Italian teachers, he moved to Rome, where he completed his dissertation in 1960. He began teaching Albanian Studies in 1961 in the Albanian Studies department in Munch University, which he himself founded. From 1971 till 1990 he taught as a Titular Professor in the same department. Martin Camaj (21.07.1925 in Temal – 03.12.1992 in Munich) was an Albanian writer, who wrote mainly poetry, fiction as well as academic work on the Albanian language and its dialects. His first two books of poetry were published in Belgrade,at the time he was studying. His lyrical work comprises nine volumes, alongside with three novels and a volume of short stories.Poetry by Camaj has been translated into Italian, English and German. He was born on 21.07.1925 in Temal, in the inaccessible hinterland of the northern Albanian cultural city of Shkodra. In Shkodra, he attended the jesuit Italian school-college Xaverianum. After leaving school he worked as a teacher in the highland villages. For a time he was involved in the resistance against the communist guerrillas, so for some time he was forced to go underground until he managed to escape in neighboring Yugoslavia. Martin Camaj died on 03.12.1992 in Munich.